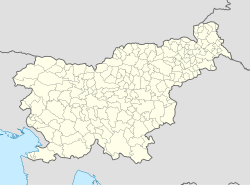 Dobrna (pronounced [ˈdoːbəɾna]) is a settlement in Slovenia. It is the seat of the Municipality of Dobrna. It is best known for its spa. It lies north of Celje and east of Velenje in an area that was part of the traditional region of Styria. The municipality is now included in the Savinja Statistical Region. The parish church in the settlement is dedicated to the Assumption of Mary (Slovene: Marijino vnebovzetje) and belongs to the Roman Catholic Diocese of Celje. It dates to the 16th century with 17th-, 18th-, and 19th-century phases of rebuilding. Wikimedia Commons has media related to Dobrna. This article about the Municipality of Dobrna in Slovenia is a stub. You can help Wikipedia by expanding it. This page was last edited on 8 March 2017, at 03:25 (UTC).